Yesterday my bf carried my heavy old computer to Low Yat Plaza to have the the pc people check and hopefully repair my pc. When the PC Zone guy check my pc, he could look and determine what's wrong already. It's no brainer sob sob my pc was bought in 2005 AHHAHAHHAH. He said I need to change the motherboard, this that n that (sounds like changing everything). My other option is try to find the same motherboard back for him to replace. I don't think I can find such a old motherboard back anymore and even if I did, how long is this granny pc gona last again. DILEMMA!!! right now should I buy a laptop or a pc? if I buy a laptop which brand and should it be a big or mini lap top? for the price of a laptop I could actually buy a awesome pc right? Also I need it on 0% installment for obvious reasons. Anyone has any suggestion?! All major blogging is put on hold until further notice. all at the same time. SO I would need like at least 2g ram to do 3 stuffs at one go. I am considering ACER's CNY promotion and 0% installment for RM1899 Travel Mate Net Book, Dell Mini (but it has only 1g ram), a PC worth RM2k and well that's all in my mind for now sigh. I am without a PC for 10days already and it's AGONIZING not to be able to do anything this CNY holiday! except eat, sleep, watch tv gain back a few pounds dammit. 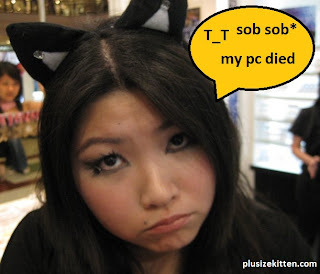 Miu, might not be motherboard problem one leh! Motherboards can last damn long one (Mine's from 2000 leh) as long as tak kena "excess electricity" aka kena power surge. Other parts are not so chun though and are spoils easier. Did the guy check each part one by one, or play play a bit then say motherboard problem? Hehee first up, I'm genuinely sorry bout you 'loss'. Surely in this age, not owning a pc/laptop is...unthinkable. Trust me, u'll be surprised to discover there's so many things that're yet to be discovered when the pc isnt on, when the bird doesnt tweet. if you're used to a PC monitor, then do not buy a netbook, the screen is super teeny weeny and u will be majorly frustrated. My pc also died early this year. Luckily I bought my netbook in time to keep me online.. hahah..